When I moved to Pilton, nearly 20 years ago, my wife and I moved into a Chalet bungalow in Lower Raleigh Road. I became intrigued by the name Raleigh. Was there any connection with Sir Walter of that name? Did the area get its name from a family? Or was there some other mystery to the name buried in the dim and distant past? I did not get anywhere at the time so put it on the back-burner, as it were, until such time that I was able to delve into the name later. When I retired several years ago, I began looking for something interesting to fill my now empty calendar and, being a member of the local church, I again came across the name Raleigh when I saw several coats of arms on a large memorial to one of the Chichester Family. I took a photo of these coats of arms and found that one of them belonged to the Raleigh family, so I decided to find out as much as I could about the name. I read a book called “Barnstaple - Town on the Taw”, written by Lois Lamplugh. This gave me a little information and threw up the name de Raleigh. Even more intrigued, I then read Margaret Reed's book “Pilton – Its Past and Present”; this gave me a lot more information, but still did not give me what I wanted to know. Martin Haddrill then lent me a book called 'Knights of Raleigh Manor' by Ray Barrow, which gave me what I was looking for. 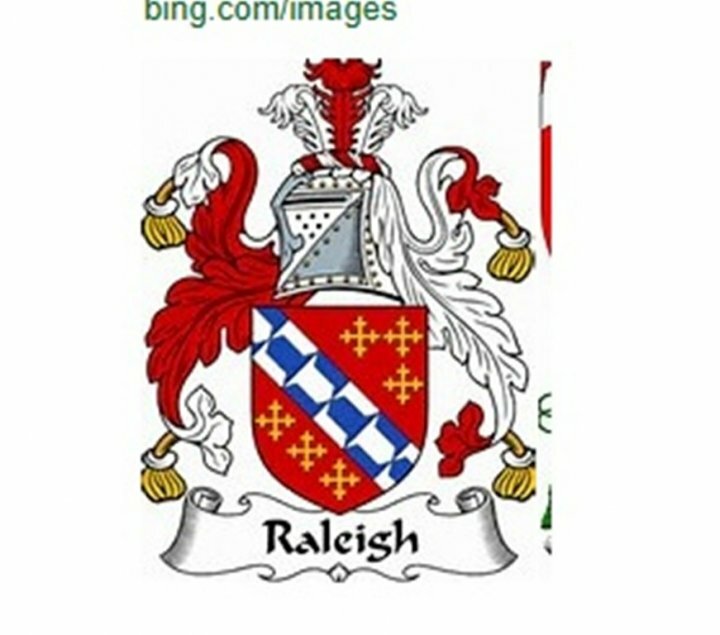 The name Raleigh does not, in fact, come from a family name but originally seems to come from an Old English word ra-leah, which appears to mean “ meadow of deer”. In 1086 the Doomsday Book spells it Radeleia and, in fact, through the middle ages, it has been spelt at least 5 different ways. For the purposes of this article, I will use the present day spelling. A man named Walter (last name not known, but it is possible he was from Normandy) fought alongside William the Conqueror at the Battle of Hastings in 1066. He came from the area known as Raleigh, and he was called Walter de Raleigh, meaning Walter from or of Raleig. Unfortunately he was slain in the battle, and his wife, Beatrix, gave one carucate (approximately 120 acres) of land in Raleigh, to Battle Abbey, for "The repose of the soul of my late husband". Up until 1135 there were at least 3 Walter de Raleighs, obviously fathers and sons. Then Walter III, named his eldest son Hugh. This son became Sheriff of Devon from 1160-1167 and was knighted, possibly for his services. It was Hugh who officially adopted de Raleigh as the family name. I won't list all the rest of the descendants; suffice to say that the Raleigh family lived in the area in Raleigh Manor which used to be where the North Devon Hospital is now. The last member of the family in the area with the Raleigh name was Sir John Raleigh (by this time the "de" had been dropped from the family name) whose son, Sir Henry Raleigh died without issue and predeceased his father. The only remaining child was a daughter named Thomasine who was the sole heiress. She married Sir John Chichester of Arlington Court, another well-known local family who also fought at the Battle of Hastings. It is not known whether Sir Walter Raleigh, who was born in Hayes Barton, Devon, the famous sea-faring adventurer, was part of this family, but with the proliferation of the name Walter in the family, I believe that there is a strong possibility, that he could have been a family member who moved to Portsmouth to pursue his dream.